1 OH & S WHOSE RESPONSIBILITY IS IT ??? 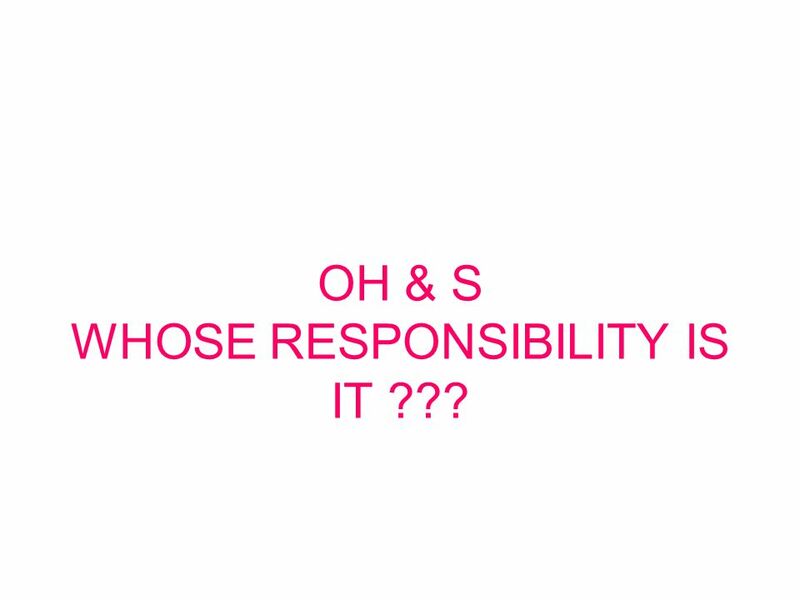 Download ppt "OH & S WHOSE RESPONSIBILITY IS IT ???. The Victorian Occupational Health & Safety Act (2004) states that the employer must as far as is reasonably practicable,"
Three Dutch Soft Law Instruments Short Introduction Rob Triemstra Ministry of Social Affairs and Employment Occupational Safety and Health Directorate. The Occupational Safety and Heath Act (OSHA) International-1970 OSHA Agencies also in China, Europe, North America, and Mexico. Health & Safety upon recruitment change of job or responsibility new equipment or technology changes in systems of work Why Do It? s2. HASAW Act 1974 The. Occupational Health & Safety (OH & S) Overview. Human and Money Costs Each year in Australia, about 3,000 people die from workplace accidents and diseases. 1.Background and Justification 1.1 :Identification Of Core Problem Although Fiji has not ratified Convention 155 on Occupational Safety And Health it. 1 Work Health Safety. 2 What is WHS? The WHS Act 2011 replaced the Occupational Health and Safety Act 2000… WHS came into legislation from January 2012. 113 Health & Safety Task B Test Research. Managing Staff in Small Business – Lesson Five BUSINESS MANAGEMENT. Monitor a Safe Workplace BSBOHS407A By Amorntip IM-UM ID : C62151. Occupational Health and Safety SRXOHS001B & SRXOHS002B Presented by: Deb Moloughney.  Outsourced HR  Offsite Human Resources  On-site support  Outsourced recruitment  Outsourced payroll  Outsourced learning. 1 Work Health Safety Presented by Mitch Bates. 2 What is WHS? 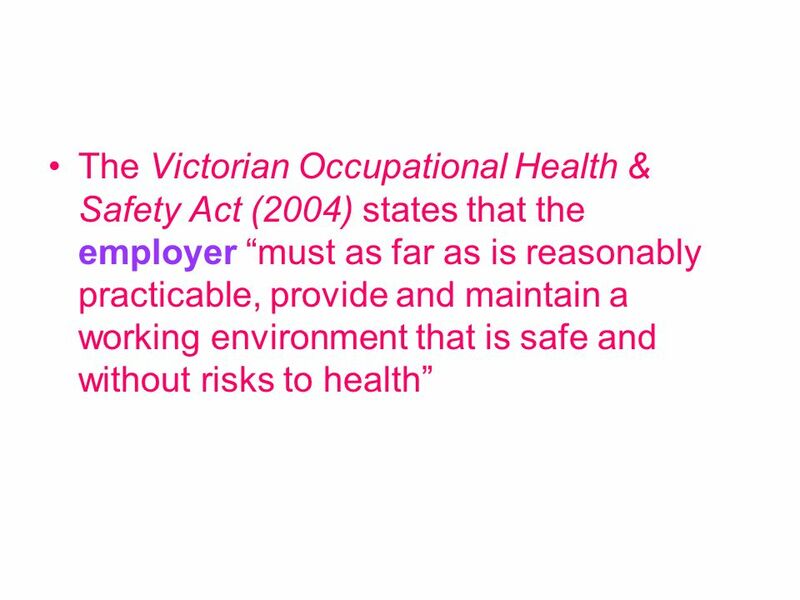 The WHS Act 2011 replaced the Occupational Health and Safety Act 2000… WHS came into legislation. The most precious commodity in your organisation? 1 CHCOHS312A Follow safety procedures for direct care work. Legal duties of employer and employees Health & Safety legislation has recently grown. Initially it was introduced in response to accidents that involved.